Welcome to rumorland, where we look at smoke from afar to figure out if there’s any fire. This time, signs point to a new iPhone 7 Pro. In addition to the iPhone 7 and iPhone 7 Plus, the Pro model would feature a dual-camera system as well as a smart connector at the back. Two photos spotted by Nowhere Else shows the three models side by side. 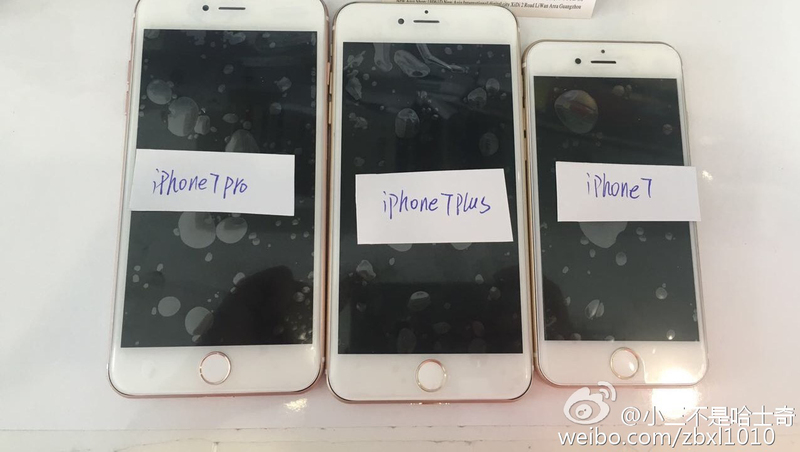 As expected, the iPhone 7 Plus looks like a bigger version of the iPhone 7. And the iPhone 7 Pro could be a more powerful iPhone 7 Plus. Similarly, reliable Apple analyst Ming-Chi Kuo from KGI Securities already predicted that the iPhone 7 Plus would get a dual-camera system. The iPhone 7 won’t get the dual-camera system indeed. But if today’s new photos are true, there will be an iPhone 7 Plus with a regular camera and an iPhone 7 Pro with an improved camera. Now, why would Apple put two cameras at the back of your iPhone? There are many potential use cases. LinX has built a hardware and software solution to make two (or more) lenses seamlessly work together. For instance, a dual-lens system could improve background defocus and recreate depth of field — background defocus is one of the reasons why people use low aperture DSLR lenses. Two cameras could also improve low-light performance, color fidelity and HDR performance. And this module could let you focus on the foreground or the background after capturing a photo, like with a Lytro. You can also spot a smart connector at the back of the iPhone 7 Pro. Apple introduced these magnetic smart connectors with the iPad Pro as a way to expand your devices with accessories, such as keyboards. With the iPhone 7 Pro, Apple might take advantage of this connector for a battery case. According to all of these photos, it looks like the iPhone 7 is going to have the same pebble-like design with rounded edges. The back of the phone is still made out of aluminum. But there are three main differences. The antenna lines on the back are slightly redesigned. It makes the phone sleeker as the back now looks like one big piece of aluminum. Finally, I’m sorry to say it, but the headphone jack port is gone. Get ready to use a dongle with your fancy wired headphones. But MacRumors also discovered that Apple now owns the trademark AirPods. What a weird coincidence.